My adventuring this week in EQ2 has been a little slow because of some RL issues affecting everyone in the group. You could definitely classify it as guild drama if we were in a guild right now, but its more or less just the final throws of a kind gesture gone bad. Despite this rather large distraction to the group, we did manage to get together last night and finish all three of our Armor Quests. I first saw the Beserker Armor set the other night in Fallen Gate on another tank and after a quick /inspect, I found out about the quest line. 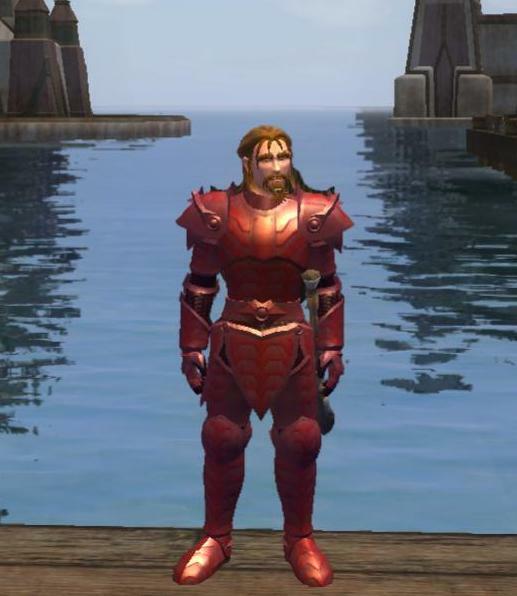 Its a good looking set of armor and I’ve seen some models similar to it around the city in different colors, so it must not change much between classes. The Inquisitor in our group finished the set last night as well, but I have yet to see it as she likes to wear a dress over everything. She does look damn good though. During the fourth part of the quest, we stumbled upon an outpost on the northeastern edge of Nektulos. Turns out we needed a NPC there for the update before heading back to Freeport. What was interesting, was that there was a small cellar door next to her labeled Lair of the Necromancer. Turns out the place is a small instance for level 24 and above and has a quick boss battle at the end of the tunnels. One guess on what it was. We were a bit overpowered for the entire instance, but the boss battle was interesting enough to keep us on out toes. He dropped a pair of slippers that nobody could use but hopefully I will be able to transmute as soon as I get that skill high enough. I’m going to try out this new slide show system that WordPress recommends thats called Rock You. Its kind of nice that it links to my gmail account, but because its all flash based I can’t save what I created to my PC. Meh, its free and has a lot available to customize the images. I would recommend it so far. How does EQ2’s transmute system work? What could you change the slippers into? Do the stats transfer completely? You basically refine the item down to a special component, this is used in conjunction with crafting to add enhancements to specific pieces of armor,items, or weapons. I haven’t had the chance to delve into it as much as I have wanted, but I think will have the time this weekend to do so. You may just see a post coming about this as I know a lot of new players are interested in it. Looking good brack :). The zerker armor does look wicked. Liking the armour look you have going there my friend! The slideshow thing works great btw and looks fantastic! Lair of the Necromancer huh…all I can say is thanks for reminding me!! I did that small zone with one of my first toons and had forgotten about it ever since. I loved it when I did it with my Necro. Think I need to scour my alts for a level suitable to head on in again. Sorry I missed you at the weekend though mate. Hopefully we will catch up soon. Yeah, its not a huge instance and could probably take just about 20 minutes, but it was a nice find and I really like the amount of easter eggs that this game seems to have.